I’ll never forget my first (and last) trip to Disney World. Does anyone? Walt Disney World — a child’s dream, the most whimsical place on earth, the meringue topping on the above cake. The place where kids can be kids and adults can soak up the magic of satisfying the wittle apple(s) of their eye. And I have no desire to go again. I spent the months preceding the trip — and this was when I was in elementary school, mind you — hitting the books, charting a path, mapping the hours, and planning, down to the minute, which soul-sucking line we’d need to wait in to get to every stop on my list. There were very small time slots allotted to bathroom breaks and sustenance catchers (let’s face it, there is no real “dining” in Orlando). Was it worth it? Did I have fun? Was the alarming authoritarian schedule barked by the 10-year-old general worth it? Well I got to every single scheduled ride (without throwing up), parade (the festival of lights was decent), and attraction except for one: Pirates of the Caribbean, a Disney classic. I’d call it a success. But did I cherish any of the moments and look back on them as a time that brought me closer to my family? When I finally got to the Magic Kindgom — the pillow of meringue — I felt little. Smile. Snap. Photograph. Move on. I later stood in awe at the castle’s foundation during an evening fireworks show that sent the most colorful plumes of light over the tall towers; but in daylight, its magic was obscured by the fact that my notebook dictated that we had to hustle along. No, the real child utopias are in the backyards and the local parks, the pebbly beaches, and the tiny spots that children carve out as their own. The special moments are found in the tea parties and the attic explorations. The acts of careless excitement take place at the ballet bars and on the basketball courts, where little legs can dance and run free without tackling crowds and giant mice. I will always be a planner, a calculator, an organizer; but, I will never again plan a trip around what I have to do. I make it a point to seek out the unique. I try to let go and linger. I dream of seeing real places with history and culture, not Epcot’s overdramatized and, sometimes, culturally insensitive installations modeled after Mexico, and Morocco, and Japan. My name is Sacha and I can make chiffon cake at 5am, drunk and with my eyes closed. I can make chiffon cake with a killer migraine. I can make chiffon cake on the roof of a burning building. I can make chiffon cake after eating six chiffon cakes. I can make chiffon cake in tube pans; jelly roll pans; 8-inch, short-sided springform pans; 9-inch cake pans; 9-inch, tall-sided springform pans; and 10-inch cake rings with 3-inch sides. I can make chiffon cake with the help of a stand mixer or with nothing more than a simple balloon whisk and some muscle. And, 72 eggs later, that’s pretty damn annoying. 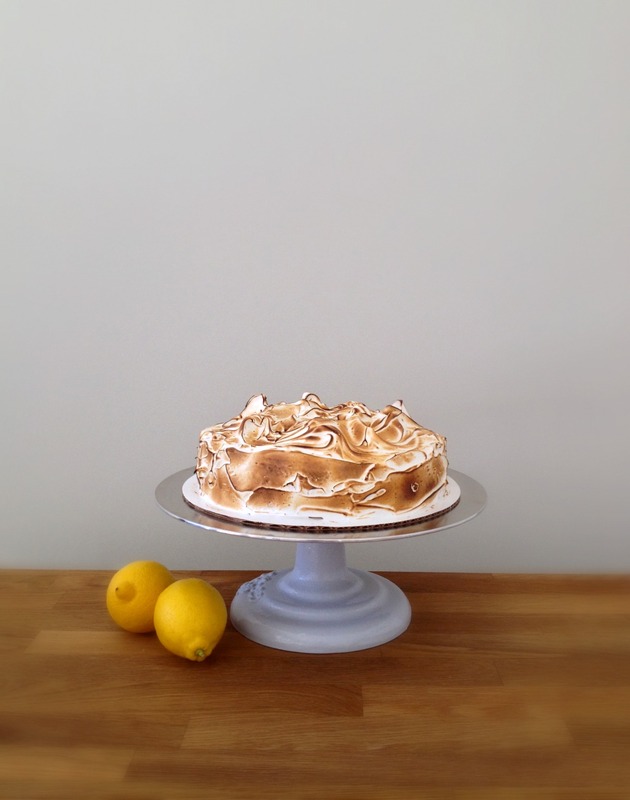 This gorgeous take on the Tartine Bakery Lemon Meringue Cake is supposed to be a monstrous dessert. The chiffon is made in a 10-inch round pan with 3-inch sides, torted into four layers, and meant to serve 12 to 16. When you’re making a cake for someone who has just a few to share it with, it’s impractical. And, for chiffon, it’s not necessarily the best choice. Chiffon cake was originally developed for a tube pan for a reason. The egg white–leavened cake needs that central core of evenly distributed heat to get high and stay that way. Chiffon cakes can be modified to be layer cakes made in round pans. But the operative word is modify. The Tartine recipe is inflated by a whopping 10 egg whites — perfect for a tube pan, but when the batter is spread across a 10-inch expanse, only those with the most sophisticated of ovens (and the best luck) will find that their cakes can hold their own weight without creating a cavernous dip in the middle. If the cake is made correctly, the dip is small, but who wants a dip at all? Yes, this sinkage can be the result of user error — underbaked cake, overwhipped whites, underwhipped whites, improper folding, a too-short pan, a nonstick pan — but it’s not always the baker’s fault. I wanted a chiffon cake recipe to add to my arsenal that could be used for a layer cake, as the texture of this all-American cake makes it super-versatile. After trying countless fussy tricks, I ended up just making the tweaks that I thought were necessary. The standard amount of all-purpose flour is swapped for cake flour, which can better carry sugar and water and sets faster; the egg whites are taken down a bit and a small amount of extra baking powder is added to make up the difference; cream of tartar goes up as a safety net, and salt goes up for flavor. 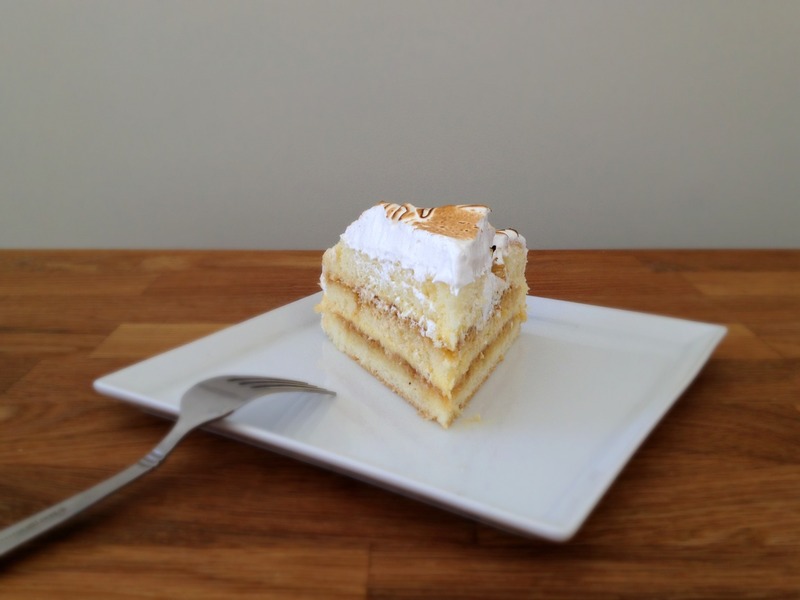 This chiffon is light as a cloud and spongy yet wonderfully moist and sturdy enough to hold up fillings like lemon cream and caramel (here) or berries and whipped marscarpone and the like. It remains downy-soft for days both at room temperature and out of the fridge. Of course, oil-based chiffon cakes don’t have the same depth of flavor as butter cakes, but their fillings and toppings typically make up for the difference. This cake is a workhorse. 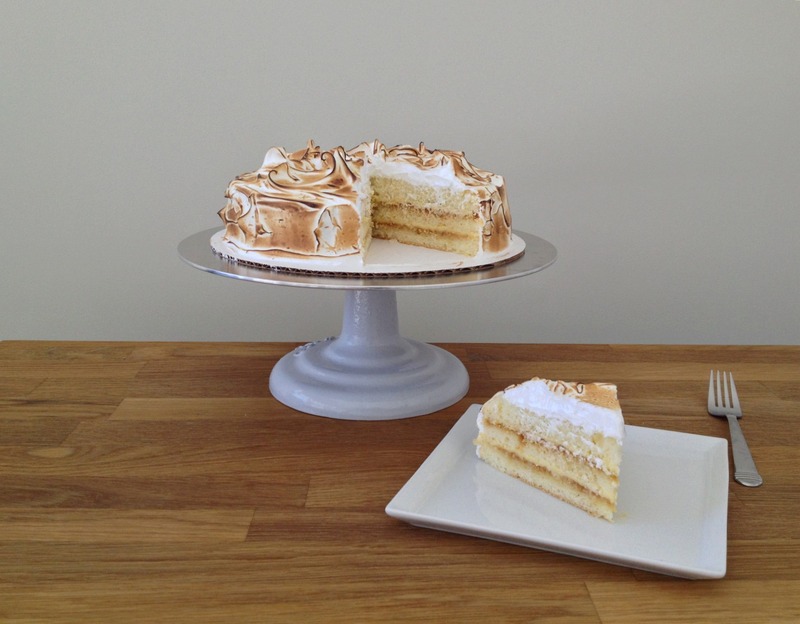 Though more petite than the one sold at the San Francisco institution, this cake is a showstopper, especially once torched so deeply that it doesn’t feel too too sweet (though I also held back on the meringue a bit, because I’m not usually a fan). And it captures the exact flavors of lemon meringue pie, yet with a more sophisticated edge from the grown-up and very French lemon cream and mature caramel. Armed with the perfect chiffon layer cake recipe, you can make this cake and feel like a real kid again. Your vegetable oil must be 100% pure and silicate-free as silicates inhibit foaming. Use a cake pan with at least 2-inch sides. Be sure not to use a nonstick cake pan. To make more layers (or thicker ones), you can double this recipe and bake it in two 9-inch cake pans. Adjust oven rack to lower-middle position and heat oven to 325 degrees. Line bottom of 9-inch cake pan with parchment paper. Sift flour and baking powder together into very large bowl. Add 125 grams (1/2 cup plus 2 tablespoons) sugar and salt to bowl and whisk to combine. Whisk water, egg yolks, oil, vanilla, and lemon zest together in bowl to combine. Make well in center of flour mixture and whisk vigorously until mixture is combined and free of lumps, 1 minute. Set aside. 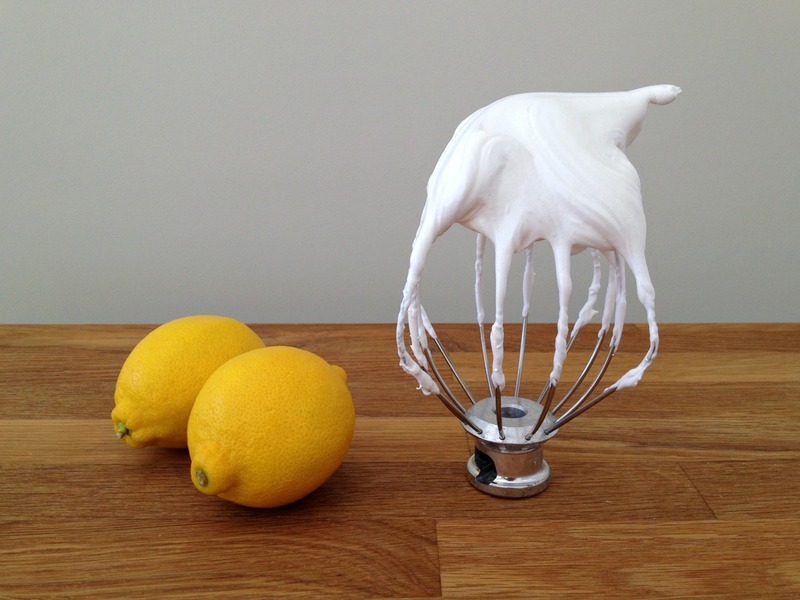 In bowl of stand mixer fitted with the whisk attachment, whip egg whites on medium speed until frothy. Add cream of tartar, increase speed to medium-high and whip until soft peaks form. Slowly and gradually pour in remaining 25 grams (2 tablespoons) sugar and whip until stiff, shiny peaks form. Gently but quickly fold one-third egg white mixture into flour mixture to lighten batter. (Streaks and some lumps should remain.) Add remaining white mixture and fold gently but quickly just until combined. Pour batter into prepared pan, smooth top with offset spatula, and immediately transfer to oven. Bake until cake is golden, springs back to the touch, and toothpick inserted in center of cake comes out clean, 40 to 50 minutes. Let cake cool in cake pan on wire rack for 1 1/2 hours. Run thin knife around sides of cake pan and invert on wire rack, removing parchment. Invert right side up and let cool completely on wire rack. Use as directed in your recipe. This caramel is made specifically for filling cakes. It’s stiff enough that it doesn’t squirt out readily, but it is easy to spread and not-at-all chewy or candylike. The chiffon cake recipe I posted is rather foolproof, so you shouldn’t have much trouble at all. It’s not a quick project, but it’s definitely a fun one! I can remember begging our parents to take us to Disney for YEARS. My brother and Dad did all the organisation so I just did what I was told :-) I absolutely loved it but you’re right, the more lasting memories are in birthday cakes, playing in the park, sitting on my parents’ knees etc. This looks like a very beautiful cake and well worth the 70 odd egg experiment it took to get there! Oh, Disney can certainly be fun. But not when you plan it to the minute–at 10 years old. That was my problem! This makes me wonder… what are you doing drunk at 5 am (and baking with your eyes closed) and where are the leftovers?! You need to move closer to work so you can bring treats in. :) I still get made of fun by family to this day (because it’s on video) from when we went to Disney back when I was a kid, and even though we had gone to tons of gift shops–and they all carry the same things–we never went to Mickey’s Emporium. I am on video chastising my parents for breaking their promise to take me there. Oh Disney. Mickey’s Emporium – ha! Seems like Disney has a way of turning good kids into little terrors. I made this cake for someone, so leftovers weren’t for keeps, but I still need to move closer soon for my sanity! You are awesome. I’m impressed at your determination. Beautiful cake! 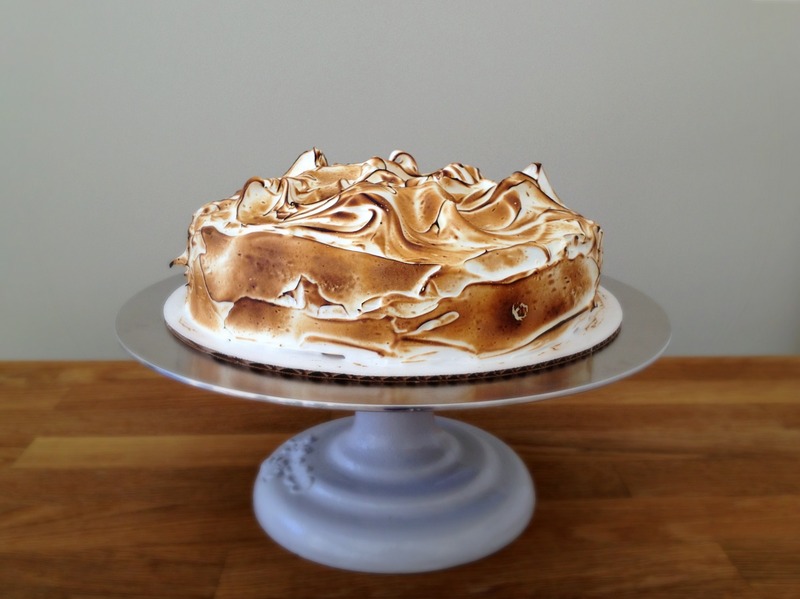 I’ve always loved how torched meringue looks. Gorgeous. Thanks, Sarah. 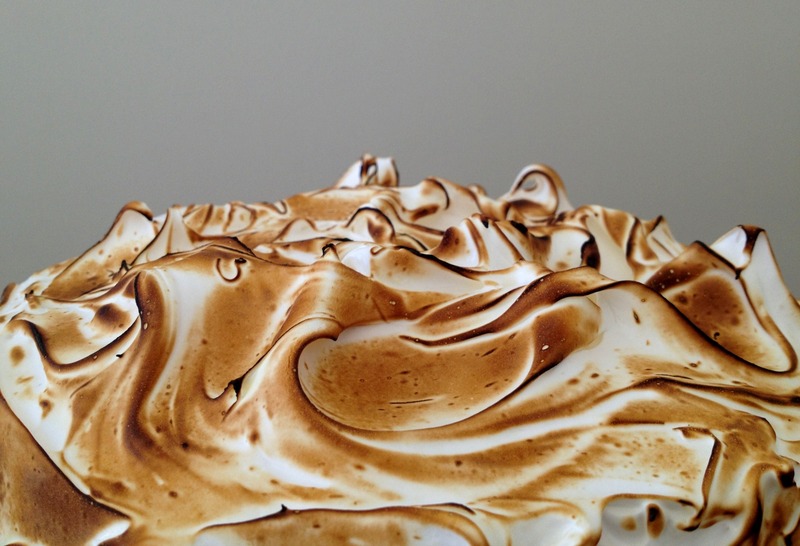 I love the look of torched meringue, too. The darker the better!